The Windows 8 Explorer Ribbon is minimized by default. But, if you log off with it maximized, when you get back it’s still maximized. Here’s how to keep it permanently minimized. One of the new features in Windows 8 is the Windows Explorer Ribbon. It’s minimized by default when you first install the new OS. If you expand it to use any of its features and restart your system, Windows “remembers” it was open and it’s displayed when you go to the Desktop. Here’s how to save screen real estate and make sure it’s always hidden. While using the Desktop, use the keyboard shortcut Win Key + R or select Run from the Power User Menu. Then type: gpedit.msc and click OK or hit Enter. 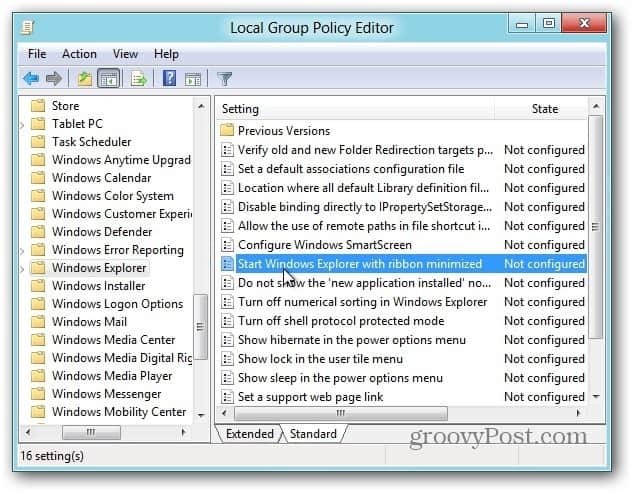 Local Group Policy Editor opens. In the left panel navigate to Computer Configuration >> Administrative Templates >> Windows Components >> Windows Explorer. Double click on Start Windows Explorer with the Ribbon Minimized. 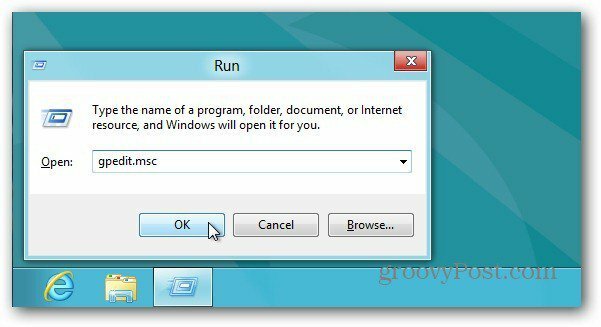 Enable the option and click OK.
Now anytime you maximize the Windows Explorer Ribbon and restart your system, it will be minimized when you log back on.